Escape to the Islands with a light blend of sweet melon, raspberry, creamy coconut, italian lemon and raw sugarcane. Limited Time Scent, Available thru Summer or until sold out. ♥SWEET ALMOND OIL conditions the skin, relieves dry skin and helps to retain your skin's natural glow. It is also a natural moisurizer for dry skin because its rich in Vitamin D and proteins. ♥My 2 oz. size is PERFECT FOR FAVORS! PERSONALIZE your label, and choose your favorite scent & color. Please contact me for pricing for your next baby shower, wedding or other special event. Example: Sara's Bridal Shower, It's a Girl, Tom & Kate's Honeymoon, Happy Birthday Julie! 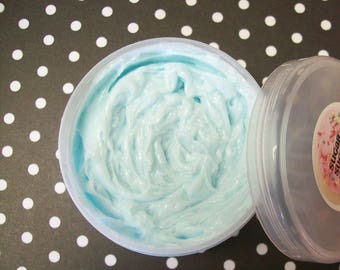 ♥To Use: Use Parfait as a bath whip or shaving cream. Do Not Eat. Discontinue use if irritation occurs. Shower may be slippery after use. ♥Handmade products may slightly differ in texture/color. Ingredients: Glycerin, Water, Sweet Almond Oil, Sodium Cocoyl Isethionate, Sorbitol, Propylene Glycol, Disodium Lauryl Sulfosuccinate, Stearic Acid, Sodium Chloride, Diazolidinyl Urea, Iodopropynl, Butylcarbamate, Fragrance Oil & Colorant. 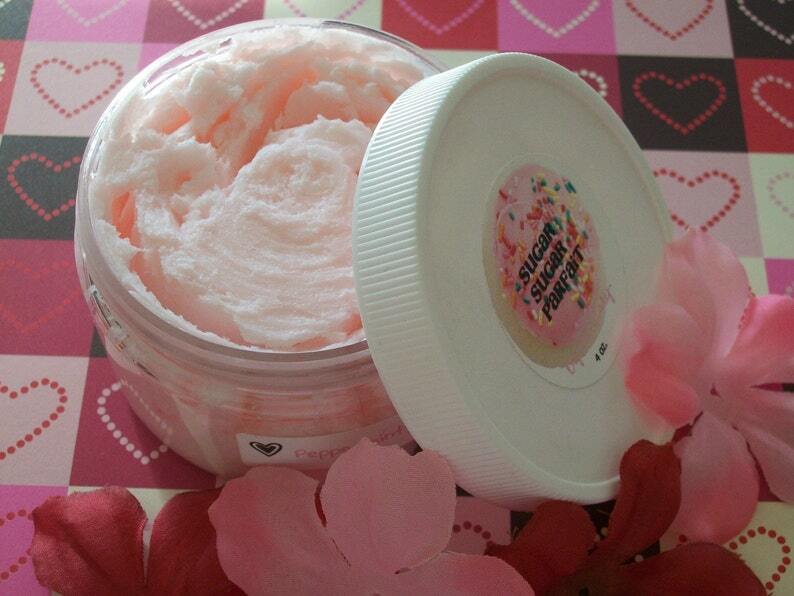 Whipped Soap Parfait - PEPPERMINT KISS 4oz. LOVE STORY Shaving Soap - Cherry Blossom, White Jasmine and Peach Whipped Soap Parfait - 4oz.